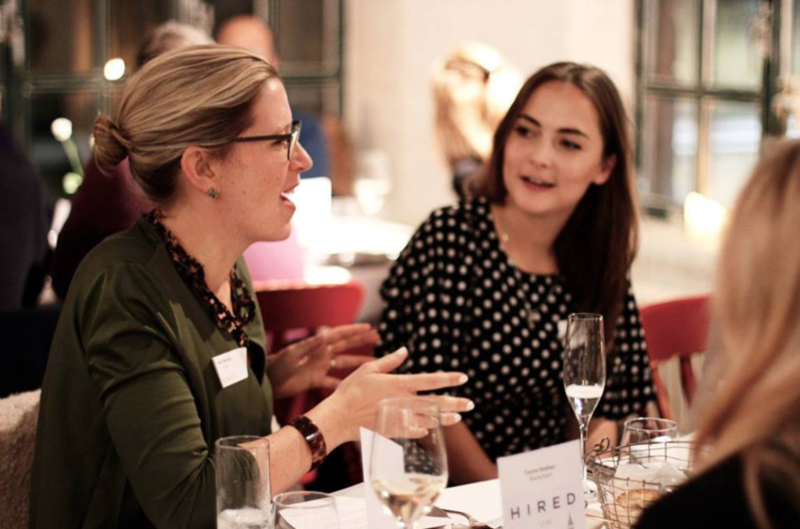 At Hired, our goal is to bring more transparency to the hiring industry, and part of that is giving candidates and companies the insight they need to make smart decisions. 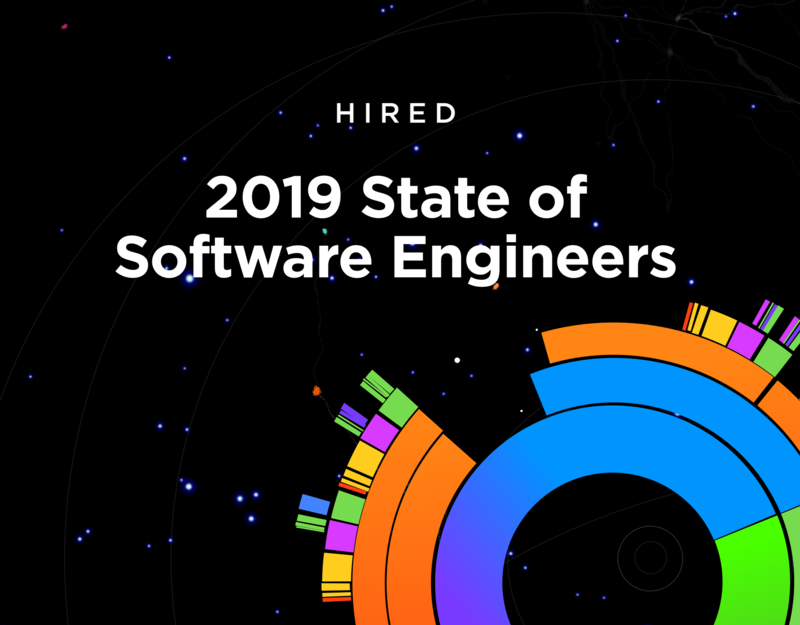 That’s why we’re releasing our second annual Global State of Salaries Report, which offers an in-depth look at tech salaries across 16 global markets and examines how the market you live in, your role and even your race and age affect your compensation. 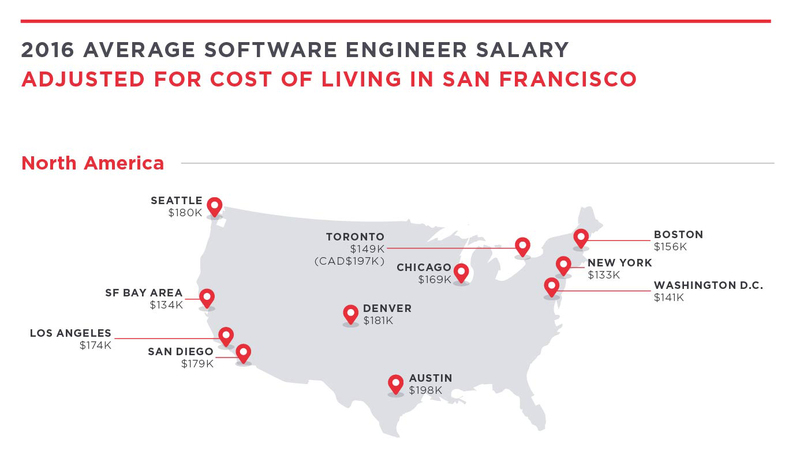 While Bay Area software engineers are the highest paid in the country ($134k), their relative purchasing power lags behind their peers in cities with lower costs of living. Using a standardized cost of living calculator, we adjusted each city’s average salary to be equivalent to San Francisco’s cost of living. In the US, Austin, Denver and Seattle take the prize for best-off tech workers. For example, software engineers in Austin average $110k per year, but they are able to afford a lifestyle that would cost $198k in San Francisco. Looking abroad, these numbers vary even further. Salaries in the UK, for example, are among the lowest in the world. Even when factoring in cost of living, SWEs in London make 25 percent less than those in San Francisco and 30 percent less than those in New York. In nearly every market, companies offer more money to individuals who are relocating than to local candidates. 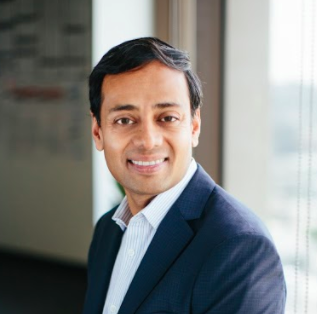 Paris, London, Singapore and Toronto are particularly motivated to lure the right tech talent: non-local candidates in those market can earn between 21 percent and 57 percent more than locals. Twenty-seven percent of candidates who receive offers from UK companies come from outside of the UK, and the average relocation offer is 28 percent higher than that of local UK workers. With the uncertainties from Brexit around visas for foreign workers, this underscores the importance for the UK to continue to invest in developing of a pool of local talent. 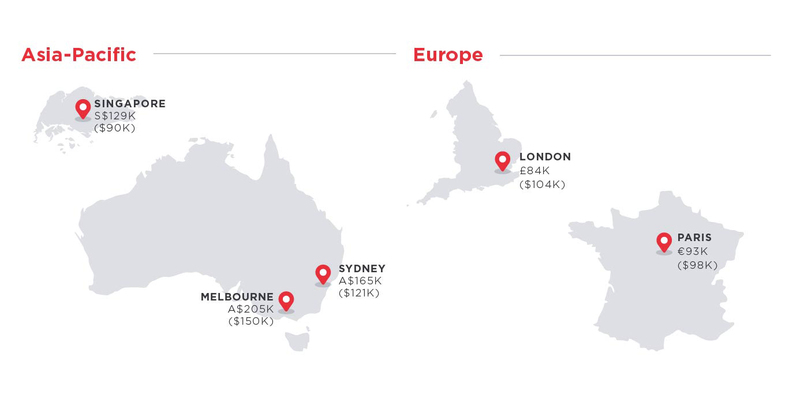 Cities like Melbourne, Sydney, Boston and New York sit on the opposite end of the spectrum by prioritizing local talent. In those cities, transplants are paid the same or slightly less than locals. In our effort to bring more transparency to the hiring process, we recently began collecting voluntary demographic data that reveal the impact racial and age biases have on salary and hiring rates. The average African-American candidate on the Hired platform is 49 percent more likely to be hired than the average white person, but they request and receive significantly lower salaries ($10K less on average). Latino and Asian candidates have a different experience: the average Latino candidate is 26 percent less likely to get hired than the average white candidate, and the average Asian candidate is 45 percent less likely. 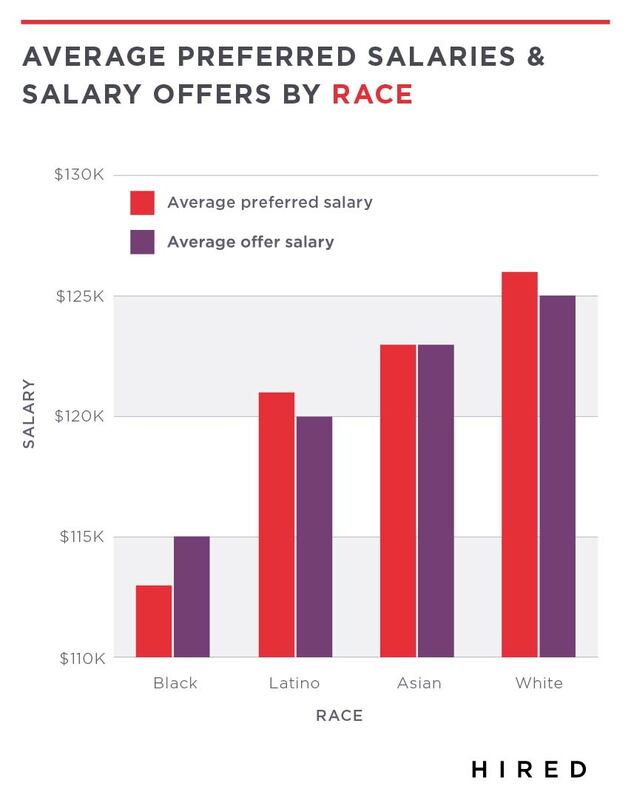 However, their salaries are more in line with white candidates (Latinos receive $5k less, and Asians receive $2k less on average). 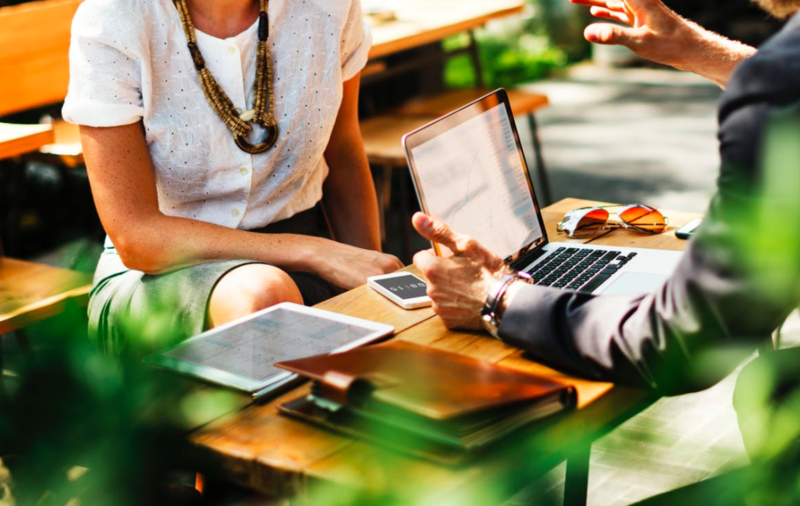 While ageism isn’t as widely discussed, once candidates pass the age of 45, they begin to see a decrease in their average salary and the number of job offers they receive. 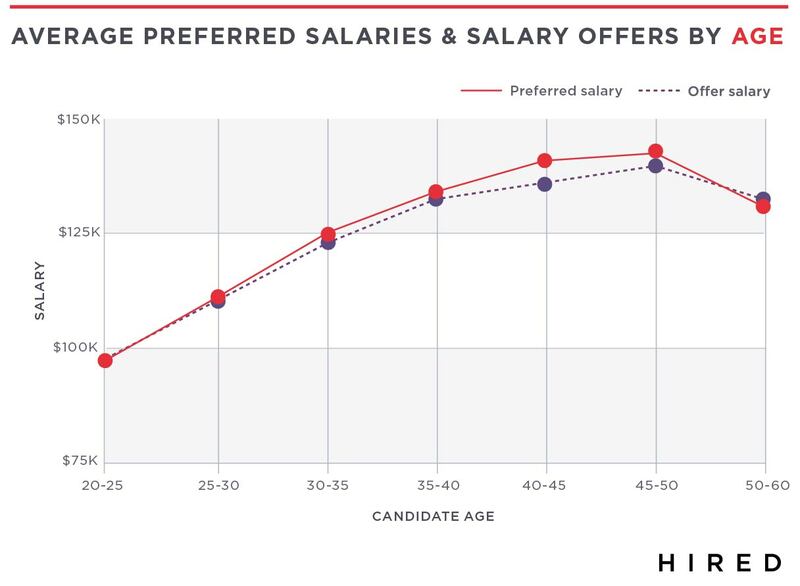 Companies offer an average of $132k to candidates between age 50 and 60, which is on par with what they’re offering to candidates who are ten years younger, and presumably, who have ten years less experience. Hiring is hard, but we hope candidates and companies can arm themselves with data to make the process easier. To find out more, download our entire report here.